The first hint of fresh air comes on the fiery Full Moon Lunar Eclipse at 00° 52′ Leo on 20 January 2019, 09:17 PM PST. The Sun has reached airy Aquarius, finally giving us a full time presence in an air sign again. There is plenty of fire with the Leo Moon, Venus and Jupiter in Sagittarius plus Mars and Uranus in Aries. All of this adds up to the possibility of expanding our horizons and being able to visualize future directions. A dynamic T-Square between the Leo Moon, Aquarius Sun and Uranus in Aries invigorates the atmosphere. This is one of those ‘by the numbers’ squares with all the planets involved in harmonious signs. Aries and Leo are both fire signs plus Uranus rules quirky Aquarius, so the energies of these three planets blend nicely. The Aquarius Sun brings objectivity and innovative thinking while the Leo Moon provides warmth and creativity with Uranus in Aries encouraging independent action. Cardinal fire (Aries) is the dominant energy of this lunation, supporting self starters everywhere. A source of dissension may come from a waning Mercury-Pluto conjunction in Capricorn widely square Uranus in Aries. Mercury-Pluto in Capricorn can be obsessed with staying in control at all costs and will tend to see any type of change that encourages freedom of choice as a threat. As individuals it wouldn’t hurt to seek to remain as neutral as possible for now. However we may see plenty of bizarre, obsessive, controlling behaviors in the news. The really challenging configuration in this chart is an odd trapezoid with a trine between Venus-Jupiter in Sagittarius and Mars in Aries as the base. The top is a sextile between Saturn in Capricorn and Neptune in Pisces with semi-sextiles forming the sides. We can’t overlook the two internal squares, one between Mars in Aries and Saturn, the other between Venus-Jupiter in Sagittarius and Neptune in Pisces. This pits fiery enthusiasm for future endeavors against compassionate conservatism at its best . . . both very positive things. The fiery side is going to be very impatient, anxious to chase impossible dreams while the earth-water pair seeks pragmatic but caring solutions. It may take some creative thinking but we can certainly practice being practical during moments of irrational exuberance. This is the type of dissonant energy that can produce great works of art. 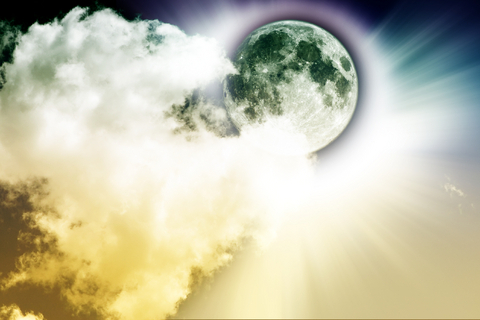 Full Moons can be emotionally stressful and lunar eclipses even more so, making this the perfect time to practice kindness, tolerance and patience. Capricorn season was weighted heavily toward earth and water this year, so this first real taste of fire and air can be intoxicating. However not all that is tried and true needs to be tossed out in our pursuit of something new and exciting. Enjoy the warm, fizzy atmosphere but keep one foot firmly on the ground.